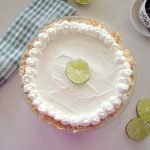 A key lime cheesecake that is set in a coconut crust makes a luscious dessert. Brush the inside of a pie dish with coconut oil. Spoon the mixture into the pie dish and with clean wet hands, press the coconut mixture around the sides and bottom until the dish is covered. In a bowl beat the cream cheese with a whisk until soft. (Or by hand with a spoon and a strong arm!). Add the sweetener, lime juice and vanilla and whisk away until blended.